Although most people employ the "sniff test" to determine if their food is still good, this method can be misleading and dangerous. Many organisms that cause foodborne illnesses do not create any odor or visual evidence of their presence. Use these brief guidelines to help determine how long food should be stored for maximum freshness and safety. Leftovers may be the most susceptible to pathogens because they often spend an elongated amount of time in the temperature danger zone (between 40-140 degrees Fahrenheit) as they cool. Although bacteria is usually killed during the cooking process, it is quickly reintroduced from the environment after cooking. Leftovers should be placed in the refrigerator (below 40 degrees Fahrenheit) as soon as possible after cooking. Once refrigerated, leftovers should be kept for only 3 to 4 days. 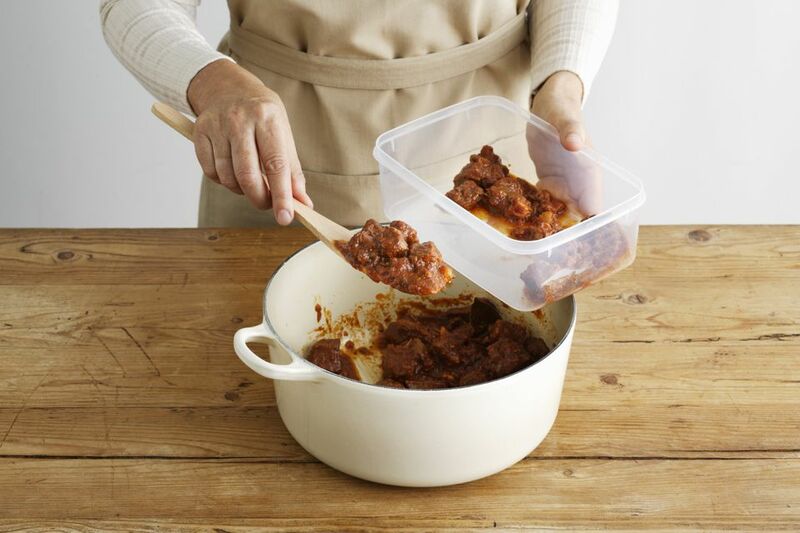 If promptly frozen, leftovers can be stored for 3 to 4 months. Eggs should always be stored refrigerated below 40 degrees Fahrenheit. Storing eggs in the main compartment of the refrigerator, rather than storage compartments on the inside of the door, will help ensure that they stay at the proper temperature. When stored properly, eggs can be kept for 3 to 5 weeks past the "sell by" date. If your eggs take on an undesirable or sulfur like smell, discard them. Canned goods can be divided into two categories as far as storage times: high acid and low acid. High-acid canned foods, such as tomato products and pineapple, have a shorter shelf life of about one and a half years. Low acid canned foods, like most vegetables and meats, have a longer shelf life of about 5 years. If you cannot remember when the product was purchased, most cans are labeled with a "Best if Used By" date that can be used as a guide. If at any time you find a can that is dented, damaged, or bulging, discard it immediately. Damaged cans can have microscopic cracks which can allow bacteria entry. What Is the Shelf Life for Active Dry or Instant Yeast?